No. 6. Le Traitor. 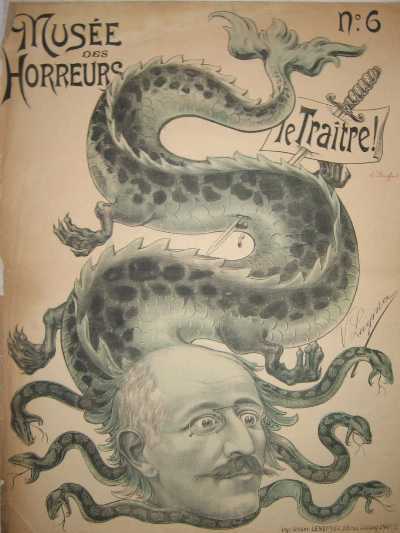 Dreyfus as a hydra-head dragon. Alfred Dreyfus (1859 – 1935) was a French artillery officer of Jewish faith whose trial in 1894 on charges of treason for which he had been framed became one of the most tense political dramas in modern French and European history. Convicted of the false charge, he was sent to the French penal colony at Devil's Island in French Guiana to serve a life sentence in solitary confinement. 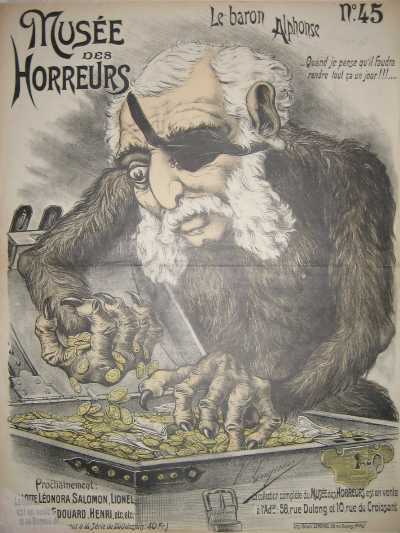 Beginning in the Fall of 1899 immediately after Dreyfus’ re-trial at Rennes and at the opening of the Paris World’s Fair, a series of scurrilous, blatantly anti-Semitic posters was issued by Gérant, publishers in Paris, The hand-colored lithographs were created by an artist working under the pseudonym V. Lenepveu. They were eventually confiscated by the police, who also stopped their production. No. 49. Le Casserole de Fontainebleau. Alfred Dreyfus as a rabbit about to be stewed. 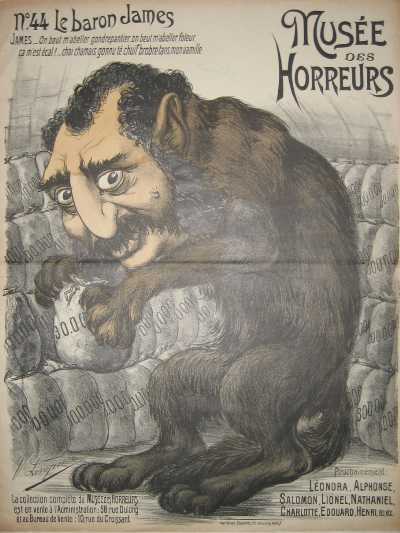 A total of fifty-one of these hand-colored lithographed broadsides ridiculing Dreyfus and his statesmen, businessmen, journalist, and Jewish leader supporters ("Dreyfusards") were issued under the general title, Musée des Horreurs (Freak Show). No. 45. Le Baron Alphonse. Baron Alphonse James de Rothschild, eldest son of James. The broadsides dramatically illustrate the increasingly hostile debate throughout the Dreyfus Affair. “Means were dirtier and more violent even than today. The clash of principles degenerated into the sort of brawl that follows a good wake. The tone of debate was inconceivably virulent: scurrilous, personal, and mostly directed below the belt" (Kleeblatt, N. The Dreyfus Affair: Art, Truth, and Justice, Berkeley, 1987, p. xxvi). Of all the posters that the affair engendered the present series “was perhaps the most ambitious... Lenepveu succeeded in these visual character assassinations by attaching peculiar animal bodies to naturalistically rendered faces” (ibid. p. 298). No. 44. Le Baron James. 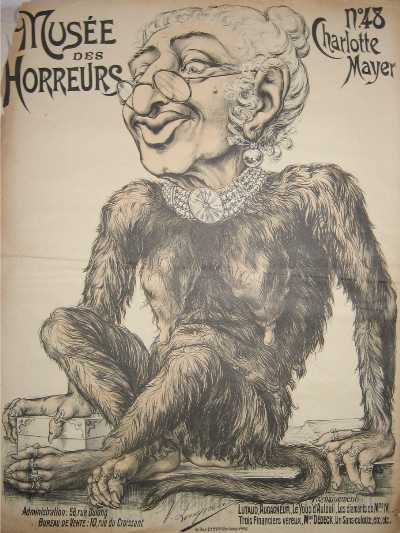 "The flood of press, poster and postcard caricatures stigmatising the ‘Jewish Republic,’ notably during the Panama Canal scandal, continued throughout the [Dreyfus] Affair, reaching hitherto unequaled heights of virulence, especially in 1898 and 1899. If anti-Semitism can exist without imagery, those who wanted to whip up public opinion against the Jews systematically used a visual vocabulary inspired by both traditional anti-Semitic and anticlerical imagery. 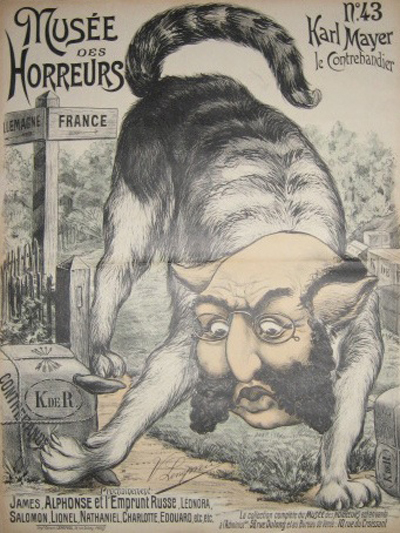 Anonymous or famous caricaturists such as Willette, Caran d’Ache, Forain, Orens and Le Petit tried to outdo one another in their attacks on Alfred Dreyfus, the Jews, [Émile] Zola and the Dreyfusards. The sheer number, colours, obscenity and cruelty of their depictions in La Libre Parole, La Croix, Le Pilori, L’Antijuif, Psst…! 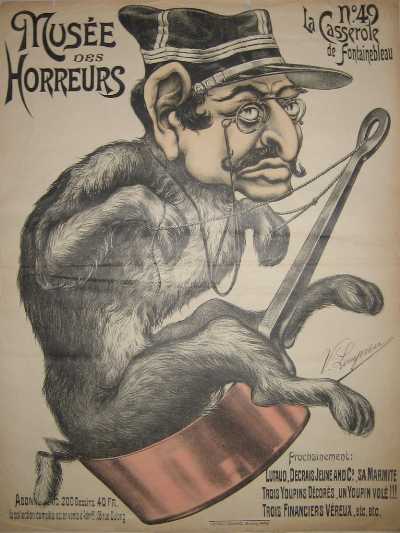 and Le Musée des Horreurs had overwhelmingly more impact than the Dreyfusard caricatures [of those in the anti-Dreyfus camp]" (Alfred Dreyfus, Le combat pour la justice). No. 43. Karl Mayer le Contrabandier. "Look...at the faces of the Baron Alphonse de Rothschild as a one-eyed octopus, and his sons, Philippe de Rothschild, Edouard de Rothschild, and Karl Mayer-Rothschild: the caricatures here are grotesquely distorting their faces in order not simply to mock them... but also to demonize them. "This is when one can see how slowly, but surely, a botched spy case dragged part of the French public opinion into the most disgusting fanaticism. The need for the caricature to be elliptic, keeping the decoding easy and funny, leads to the dangers of sensationalism by exaggerating attitudes and deforming nuances. The goal was to invite a gut reaction from the man in the street. The mob was the ultimate target. But the mob, indeed, often answered the call for action. "These often tasteless and outrageous documents are indeed part of the collective memory which transcended a judicial error into a test for the French Republic and a symbol for the fight for basic human rights" (Jean-Max Guieu, Professor of French, Georgetown University, Bibliographer Emeritus, Lorraine Beitler Collection of the Dreyfus Affair, University of Pennsylvania. Video interview transcription). was the daughter of Baron James de Rothschild. Dreyfus's re-trial in 1899 led to re-conviction and dishonorable discharge from the French army. The trial was another sham but in 1906 he was completely exonerated of all charges and reinstated into the army when the complete story of his framing by jealous officers and dubious initial investigation came out during a subsequent, unbiased inquiry. He served as an officer in WWI. Complete sets of these lithographs are extremely difficult to come by. A fine collection of nineteen of the original fifty-one has recently, however, come into the marketplace. LENEPVEU, V. (pseud.). Musée des Horreurs [Freak Show]. Paris: Impr. Gérant: Lenepveu, 58, rue Dulong..., 1899-1900. First issue. Fifty-one hand-colored lithographed broadsides, each 50 x 65 cm. Images courtesy of Davar Antiquarian Books, currently offering these rare lithographed posters, with our thanks. For inquiries, contact Davar's proprietor, Ari Grossman, here.